Rural Revolution: "People are terrified to death." In Egypt, airports are thronged by foreigners desperate to leave. Rioters are scoffing at curfews. Food is running short. Police presence is virtually gone (doubtless police officers are home protecting their own families and properties). The internet was shut down. Prisons are emptying, with dangerous criminals roaming the streets. Across the Cairo, work has come to a standstill and schools are closed. Whatever the political cause of these riots – and I’ve heard several different explanations – the riots are now feeding on themselves. Sadly, it’s the ordinary people who are taking the brunt of the unrest. The everyday business owners, residents, workers, and schoolchildren are the ones having their lives disrupted. Ordinary cosmopolitan law-abiding people who are suddenly called to defend their persons and property from gangs of roaming thugs. According to this article, people are braving the riots to stock up on bottled water and essential foodstuffs. In the absence of police protection, gangs of thugs have been looting and setting fire to buildings and cars. They've cleaned out supermarkets and shopping malls, homes and apartments. Men are forming neighborhood defense committees and arming themselves with guns, clubs, and knives in order to protect their families and homes. For those skeptical about the attachment Americans have for their firearms, here’s a classic example of why it’s awfully nice to have a means to defend one’s self. Police protection isn’t always available, especially on an individual level. For those skeptical about the obsession Preppers have for stockpiling food, water, and other necessities, here’s a classic example of why it’s awfully nice to have what you need already within the house, so you don’t have to risk your life out on the streets or fight other desperate residents for bottled water or a bag of beans. There has been linkage between some of the looting and the government. This would be a fairly clever means by the government of trying to get the army to step in on their side. Releasing prisoners would have the same effect: but with less control. Oh, why worry? That's there, not here. Not in America. That could never happen here. No. Americans don't act like that. Besides, if it gets bad here, I'll just zip down to Wally World and pick up a few cans of spam. Shaking my head, and worried for the folks with their heads in the sand. Boy howdy, having preps is sounding saner and more logical every day. The survivalist/prepper mindset is becoming more mainstream and prepper-type foods are getting harder to find (try buying a #10 can of dehydrated or freeze-dried food lately?). We live in tumultuous times and they are only going to get worse. People need to get on the ball and "Prep For Success" (to borrow from an earlier topic). These are interesting times, but I'm at an age where a little less excitement would be welcome. Patrice, this is such a huge event happening in the middle east and it boggles my mind that a lot of people I talk to here don't even know about it. Or worse, they simply take it as regular disaster news somewhere else and then move on. 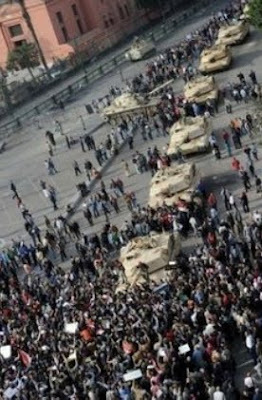 My heart is breaking when I see Cairo now! I was there on vacation a few years ago and I loved every bit of it so I am familiar with the streets when I see the news. 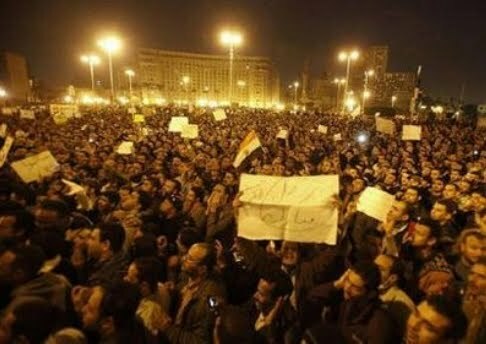 Check out some serious photos of the protests here if you wish: http://totallycoolpix.com/2011/01/the-egypt-protests/. I recommend you take a look. God has already prepared the way for us. I am in awe when I realize that these events are happening around us with lightening speed! May God bless and keep us all! I hear they're attempting to loot some of the museums and archeological sites (and have been successful in some places). Breaks this art history lover's heart. My sister got to see the mask of king Tut years ago when it was still allowed to travel the world. They had his collection here in Dallas not too long ago, but sadly some pieces weren't allowed to be viewed because of too many attempts of stealing. It just depresses me that they're willing to destroy thousands of years of history. Just a taste of what's to come here. Can't help but notice Quedula's absence from the comment posts today. I know, that WAS a little snarky. I, too, have paid attention to Wilkerson's urgent warning. John Paul Jackson has also stressed civil unrest, food insecurities and inflation, even that armed guards will have to ride along with food trucks to ensure that the food reaches its destination. Food is about to become a HUGE issue. A missionary to over 100 disaster locations all over the world, physician Dr. Paul Williams wrote a book called When All Plans Fail. God told him to write it for America. Hummmmmm...it must be that we are going to need it. "Never say Never" that what is happening in Egypt could never happen here! Today I saw a small example of what WILL happen if social unrest comes to our shores. I went to Wally World to kill some time(with no intention to buy anything) while my husband was at the doctors next door. We are expecting a rather nasty winter storm in my area of North Texas. The crowds were crazy and enormous! There was not a single gallon of milk or a loaf of bread on the shelves. A friend of mine saw me and asked "Are you here to stock up too?" My answer to her "Nope, I already have!" If one little winter storm sends out the Golden Horde in droves...just think what a greater calamity will do! Patrice thank you for the inspiration, I have several friends who now also read your website and are now in the process of prepping! This sounds like the ideal Muslim paradise. No government, no money, no law, no morality except a bastardized humanistic version of it and finally 1000 yrs. out of date. This cannot end well. I rarely use coupons, but a few years ago there was a great deal on breakfast cereal so I thought I'd go get a few boxes. The first time I went, they were out of what I wanted and they said the shipment came in at 6:30 the next morning. So I showed up then, figuring there wouldn't be too many people there. Wrong. Lot's of women there, scrapping for the few boxes that had come in. When I went to get a raincheck so I could go back after the sale was over, the checker told me that they had actually had women fighting over the stuff. It will be very scary to deal with these people when they're actually hungry. I appreciate your blog. Keep up the good work! Did anyone notice that one of the first censure ship moves Egyptian government did was shut down internet access? Is it coincidence that our feckless leader wants to have absolute control of the net here? What is going on there is a preview of will be happening here once the full brunt of our economic collapse is felt. "Whatever the political cause of these riots – and I’ve heard several different explanations – the riots are now feeding on themselves..."
We must be reading different news. AP is not reporting riots or rioting at all; they're reporting massive peaceful demonstrations involving 250,000 people in Cairo alone. Naturally, when so many people converge there's bound to be shortages of things and disruptions to routines. Imagine the Super Bowl and multiply the attendance by three or four. Indeed, the fact that there hasn't been any violence is truly amazing, and a testament to the civility of the Egyptian people and the righteousness of their cause. Anonymous 1/1/11 11:09am, there was indeed violent rioting in Egypt...last week. Over 300 people died, including some police officers. Once the police were called off and the military stepped in, the rioting calmed down. Look at a map of Africa, the entire northern portion is supposedly seeking democracy, but the real push is for jihadists to control the region. From northern Africa, it's just a jump over the strait of Gibraltar to Spain. Spain is broke, can it repel extremists? NO! And so the dominoes fall. And then there's the Suez canal and the Strait of Suez, where much of the oil that we import must pass through. Many times in the recent pass, this area has been threatened by radicals. If the radical Islamists take it over, we are dead in our tracks. Question whatever you hear and read from the MSM. We are being lied to and we must not be so trusting of our "leaders" and our "news" media. We must think for ourselves and read between the lines. The Marxists and the radical Islamists are joining forces - this is not the paranoia of a raving maniac (although i may be that), this is history repeating itself. As Christians, we are instructed by Jesus to be watchmen. We must watch and learn from what we see. We are witnessing the demise of Western Civilization. And with its fall will come the end of days. Watch, prepare, repent, pray, and be sure you have plenty of Hoppes supplies on hand. I would not feel so cocksure if I were you. The only thing that storing food will buy you is a bit more time. The best case would be food storage and isolation. Think about human nature for a while and then you should load your guns. Gee, I hate to say "I told you so," but I did. Not going to get better. In fact, the bloodbath will imcrease until the radical Muslims are in positions of power. An Egypt like Iran is just around the corner. Anonymous 2/2/11 4:14pm, you must be new here.